There was a very interesting story written by Tim Crowther on Phiona Mutesi, a chess player from Uganda. ESPN The Magazine feature the 14-year old player from a small Ugandan town of Katwe. It is an intriguing story showing how she came to learn the game of chess and her amazement of traveling thousands for miles away to Siberia to compete in the Chess Olympiad. Phiona Mutesi playing in her hometown of Katwe, Uganda. This would be the first time Uganda would send a girls team. This event would provide Phiona will a lifetime of experiences all wrapped in a two-week period. She encountered the world of competitive chess and discovered that chess is played very differently than in her village. This article provides a lot of lessons, but also show how chess can enrich one’s life. “Game of Her Life” is a must read for all chess players. Extremely informative and very moving to say the least. I will keep Pheona’s name in mind; seems like the kind of rare talent we’ve been searching for. Thanks for sharing this article with us Daaim. I read this article recently and put up a link to it on my FB page. I also sent it to quite a few persons including a couple of respected Jamaican journalists. It is a great story and reinforces, from one particular perspective, why I give so much to chess. Let us hope that the Olympiad experience will improve her life in every possible way. It is sad to see the living conditions of so many of our fellow men, especially in Africa. This article highlights the need for heightened efforts from all concerned, the UN, aid/relief agencies et al to address the plight of so many. I look at “slums” all over the world and, like countless persons over many years, cannot help but conclude that the various governments can prevent these but corruption, greed etc. prevent this from happening. Africa’s case is particularly tragic bearing in mind, inter alia, that it is a continent blessed with so many resources and gifted people. Chess is not only an “escape” but can provide tremendous possibilities (eg job/income earning) in many of these depressed communities. All the ambassadors and chess “missionaries” in every continent/corner of the world, regardless of origin, colour or creed, should be lauded for continuing to spread the “gospel of chess”. Great article!!! Phiona Mutesi’s story is inspirational. I will definitely be keeping my eye on her and hope to hear more stories of her progress. I will have to see who becomes a GM first, her or me : ) Hope to be there opening day when her story becomes a movie. When someone is able to have as little as Phiona (REAL poverty, no education, death around her, etc…) and yet and still thrive when she finds something she loves, it makes you know the importance of providing all children with opportunities, regardless of their backgrounds. 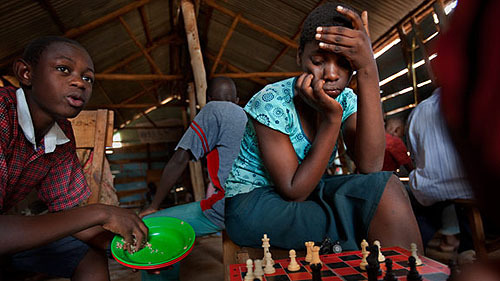 If chess could change the life of a young girl like Phiona, from the slums of Uganda, what can it do for some of our young kids here in the inner cities. This is something to think about as budget cuts are cutting afterschool programs and services. How many Phiona’s are we depriving of a way out, a window to a different world. Talent does not discriminate but sometimes it is just not nourished! –Ian, I so agree with everything you said as well. I had to read it again and again, will read it some more. What an excellent piece of story that touched the inner core of my heart. Just replace the name “Phiona” with “Ruth” and the entire story holds true without any change. Ruth was among the girls players representing Ethiopia for the first time in the Olympiad at the same time as Phiona. I remember Ruth when I saw her for the first time. She probably was 8 or 9 years old. She was one of the few girls that wandered in to attend the free chess lesson for kids me and my colleagues organized at the Addis Ababa youth sport club (YMCA). She had such a burning desire to learn the game. She would come walking to the center from one of the poorest villages in Addis Ababa, miles away from the club. She wore the same torn apart clothes every day and flippers that barely stay on her foot from years of usage. She will hold her pants with one hand or occasionally tie it on one side of her west to make sure it does not slip down. My hats off for Robert Katende.